As many of you know almost four years ago I joined Chef AJ’s Ultimate Weight Loss Program. It was the best thing I ever did for myself because it changed my life! 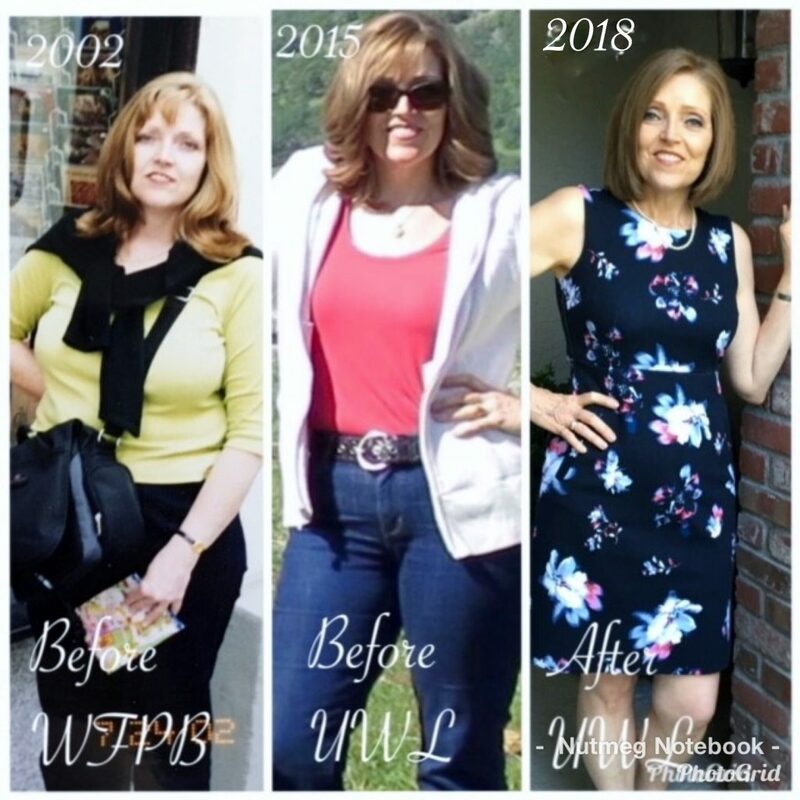 The UWL program helped me stop nearly four decades of yo-yo dieting for good! That is something to celebrate and speaking of celebrations Chef AJ is about to celebrate her 100th Weight Loss Wednesday Facebook Live broadcast! To celebrate Chef AJ is going to be awarding two scholarships to her online Ultimate Weight Loss Program! This could be the opportunity that could change your life forever. Let me share my weight loss journey with you. I was obsessed with my weight and became a professional dieter! I used to go to bed at night thinking about what I ate that day and how I would do things differently the next day. In the morning I would wake up thinking about what I was or was not going to eat that day. I was obsessed with my weight and became a professional dieter. I joined Weight Watchers for the first time when I was just 17 years young. I joined many times over the years as well as trying Jenny Craig, Nutrisystem, South Beach, Atkins and many more fad diets. I was always thinking about dieting or thinking about what I was going to fill up on next, before going on a diet! It was a crazy way to live and I was tired of it. I wanted to be healthy and sustain a normal weight where I looked good in my clothes. I wanted to avoid lifestyle related diseases like high cholesterol, heart disease, diabetes and alzheimer’s which all run in my family. I wanted hubby Tom to avoid heart disease and cancer that run in his family. Looking ahead to our retirement years I wanted to see us having fun and adventure not illness and doctors visits. I was tired of yo-yo dieting. I felt desperate to lose the weight for good. I knew Chef AJ was starting an online program called The Ultimate Weight Loss Program. I also had heard that she advocates eating vegetable for breakfast which I thought was really crazy. Desperate since I was not having luck on my own I decided to give it a try. I contacted Chef AJ and asked her if she thought her program would work for someone with hypothyroidism and she shared that she too had the same thyroid condition and was still able to lose weight. That gave me hope.I felt desperate to lose the weight for good. A calm and stable brain chemistry. I joined Chef AJ’s on line Ultimate Weight Loss program and I have never looked back. I did everything her and her UWL partner John Pierre said to do and guess what? The weight came off! It was slow sustainable weight loss. I never felt deprived – I loved the food then and I still love the food. The amazing part of eating the UWL way is that I have a calm and stable brain chemistry. There is an inner sense of peace that I never experienced before. I am never “starving” or feeling deprived. I have learned the correct foods to eat to feel satisfied and to give my body proper nutrition. I no longer obsess over food or have to think about what I will or won’t be eating on a given day. My brain is free to think about so many other things that actually bring joy to my life. The photo on the left was me at my highest weight. After seeing this photo I joined Weight Watchers and got to my goal weight and actuallys stayed there for about two years but it wasn’t easy. At times I felt deprived, hungry and I got tired of weighing and measuring my food. Eventually I gained back about 25 pounds (half of what I had lost) and yo-yo dieted. The center photo was taken after I adopted a whole food plant based diet and I did lose weight after going plant based. However at the time this photo was taken I had become hypothyroid and gained back that 25 pounds! Ugh! I was trying everything I knew to lose the weight and it wouldn’t budge. In 2015 I joined the UWL program and lost the weight for good! I am still maintaining the weight loss and love this lifestyle. Boot Camp for your life! The UWL – Ultimate Weight Loss Program could also be called the Ultimate Way to Live! This is not a quick fix – rapid weight loss fad diet. It is a health promoting food plan and lifestyle that encourages movement, meditation, compassion and helping others. Chef AJ has interviewed the experts in many fields including plant based nutrition, weight loss, exercise, psychology and addiction and she incorporates this knowledge into the UWL program. The UWL program impacts all areas of our lives and spills over to our family and friends. You will learn much more than just how to eat to lose weight – it is like boot camp for your life! You will get out of it what you put into it. If you are ready to embark on a health promoting lifestyle the UWL program is for you! Who is the Ultimate Weight Loss Plan Scholarship For? At the September Ultimate Weight Loss Live Vegas conference a doctor who was in attendance was so impressed with the program that he wanted to donate a scholarship to be given to someone who otherwise might not be able to join the UWL online program. Chef AJ is matching the donation and will be awarding two scholarships. One person who applies through my blog will receive a scholarship. Who is the Ultimate Weight Loss Plan Scholarship for? Someone who otherwise might not be able to join the program. Someone who is willing to give up salt, oil and sugar on an SOS free program. Someone who wants to have safe sustainable weight loss. Someone who is ready and willing to learn how to transform their life. Someone who is open minded to new ideas. Someone who will be active on the private facebook page. Someone who is highly motivated to set goals and achieve them. 1. Subscribe to the Nutmeg Notebook Blog email list to get notifications of new posts. 2. Like and Follow the Nutmeg Notebook Facebook page. 3. Subscribe to the Nutmeg Notebook You Tube Channel. 4. Please write a short essay of 250 words or less explaining 1. Why you want to be in the Ultimate Weight Loss program. 2. Why you are ready now to change your lifestyle. Send your essay to tami@nutmegnotebook.com One person’s essay will be selected and that person will be awarded a scholarship to the UWL online program and added to the UWL private facebook group. I must receive your essay by midnight Pacific Time on November 18th 2018. There will also be an opportunity to submit a short video for a scholarship at my friend Christin’s blog at The Nourishing Life. If you are ready to join Chef AJ’s Ultimate Weight Loss Program right now and don’t want to wait click on the link and do it today! I have an online Mexican Fiesta Cooking Class. I show you how to make 10 amazing plant based recipes. It also includes a printable PDF with all the recipes. These are recipes we use weekly and they are my go to recipes to serve to company! 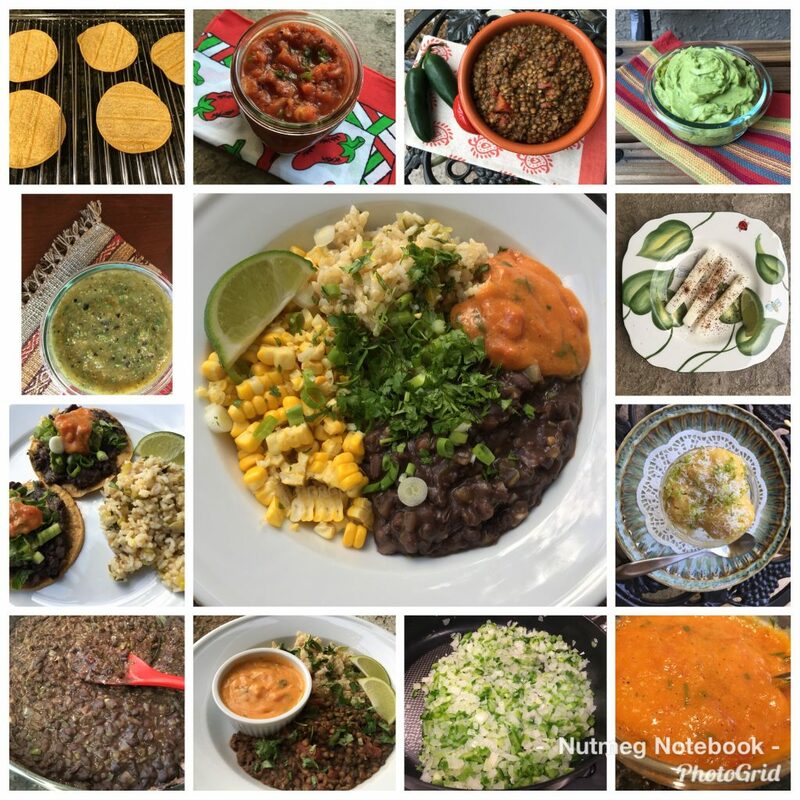 Mexican Fiesta Cooking Webinar only $9.95. My Big Beautiful Chopped Salads are my lunch everyday and are key to my success on this program. I never get tired of them! If you haven’t had a chopped salad you don’t know what you are missing. These salads have converted salad haters into salad lovers! 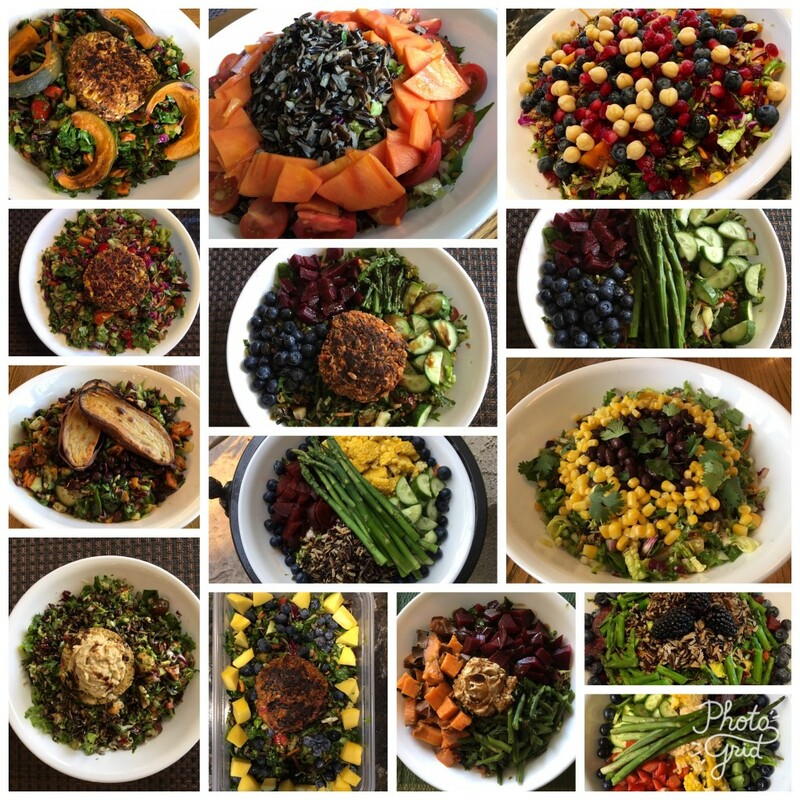 Once I figured out how to Batch Cook and Prep Food my whole food plant based lifestyle was so much easier! 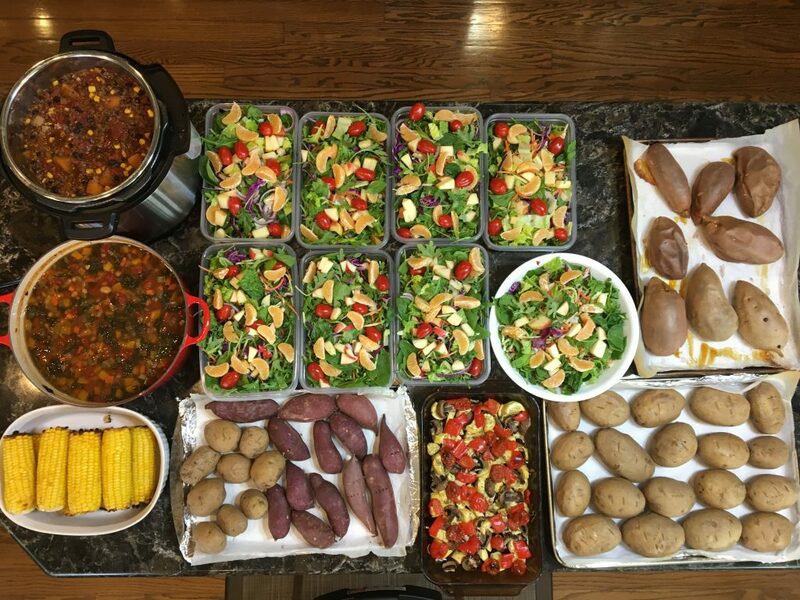 Scroll down the page to see all my posts about batch cooking. I also have a Batch Cooking You Tube Video. I just subscribed to yr UTube channel as that is where I found you ! I just purchased an Instant Pot (so so difficult as it is not available in my country ) and I was looking for recipes of course No oil, salt and sugar . Love the way you calmly and slowly explain the whole process ?. Just tried veggies on zero minutes , Perfect ! I really enjoyed your comments.Thank you so much for your kindness – you are why I spend my free time keeping this blog and You Tube channel going and it is so rewarding to read your comments and know it’s making a difference. Congratulations on choosing a whole food plant based SOS free lifestyle! It is a learning curve for sure but once you get the hang of it there is no turning back. The benefits are just too great! Where in Europe are you located? I have been to England – my great grandparents came from there and I have also visited Germany, Austria and Italy. I loved it! Isn’t it amazing that the internet allows us to “meet” and learn from one another? I love how it brings us all together. Keep in touch – wishing you well on your journey into plants.